Belgian artist Isabelle de Borchgrave is a painter by training, but textile and costume are her muses. Working in collaboration with leading costume historians and young fashion designers, de Borchgrave crafts a world of splendor from the simplest rag paper. 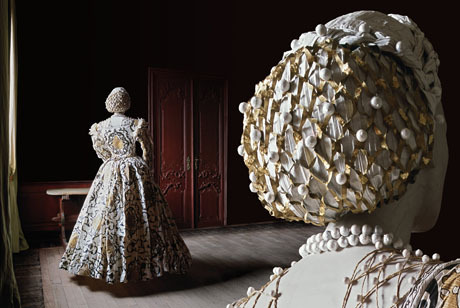 Painting and manipulating the paper, she forms trompe l’oeil masterpieces of elaborate dresses inspired by rich depictions in early European painting or by iconic costumes in museum collections around the world. The Legion of Honor is the first American museum to dedicate an entire exhibition to the work of Isabelle de Borchgrave, although her creations have been widely displayed in Europe. The word around town is this is a MUST SEE!